I was both smart and stupid in dealing with the phantom pains that I mentioned that I was feeling in my last post. I was smart, because I called up my sports doc and set up an appointment. I was stupid, because I was frustrated with the fact that the earliest appointment was a whole nine days away (9!) and decided I should continue running until the appointment. Why did I decide this? I figured that if it was real pain, it would only get worse, and therefore I would know it was real and I’d stop running. Stupid, I know, but guess what, it worked. I ended up running five times between when I scheduled the appointment, and when I finally got to see my doctor. I tried to keep those runs much slower than I had been running, suspecting that I was pushing it too hard, and that’s why I wasn’t feeling great. The first run was short and easy, just two miles, because (rationally) I wasn’t sure I should be running at all. I was worried, but that run felt fine. The second was 4 miles, and also felt pretty good, though I still had some weird leg sensations. The third run was just a mile (and more because I was late to my barre class than anything). During this time, I was pretty obsessively massaging my calf around my fracture point, and I do think I might have broken up some scar tissue around where the bone calcified, which definitely might have played into the ease of my next run. The fourth run was my longest post-stress fracture run yet at 4.9 miles, and it felt reassuringly good. I had no pain, no weird sensations. I just felt … normal, even after a spin class I had that afternoon. That run was really encouraging. And honestly, since that run, I’ve felt great. 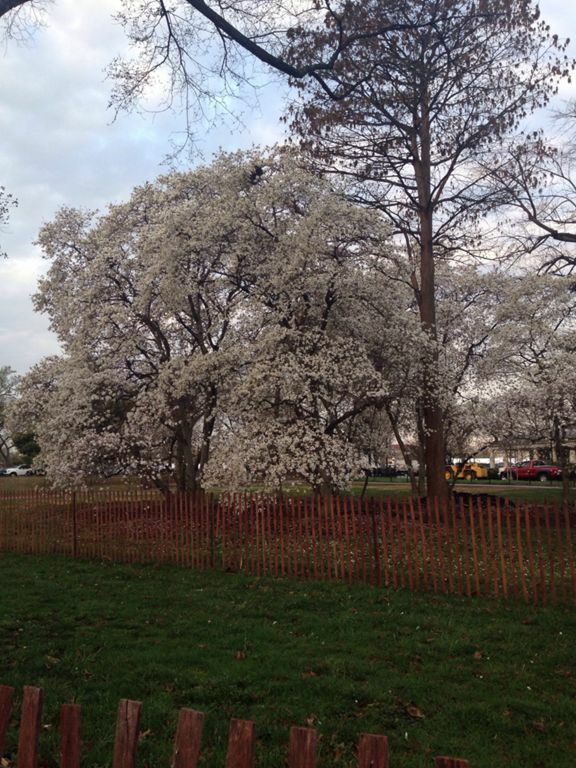 Cherry blossoms spotted on DC run! They smelled divine. When I finally got to the doctor, she agreed that I was probably fine, and pointed out that some of the problem might have been linked to the prednisone I was taking at the time for an allergic reaction. Steroids can have some pretty crazy side effects. The other interesting thing I’ve experienced in returning to running is just how quickly my muscle mass has returned! I think that deserves a post of its own, but it’s pretty impressive—like 6-8 lbs of muscle gain in 2-3 weeks impressive. Posted on April 15, 2015 July 21, 2015 by KaitlynPosted in Injury, Injury RecoveryTagged Injury, Injury Recovery, Phantom pain, Stress Fracture. Previous Previous post: The Ghost of Injuries Past, Or A New Problem?